Cyber Essentials is a government endorsed scheme to help you protect your business from cyber threats. Whatever size your company is, Cyber Essentials can provide a method to protect against the most common cyber attacks. The certification process requires an assessment of your IT security and submission to be assessed. 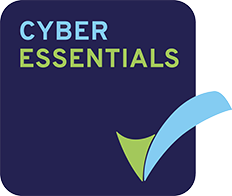 Here at Aspect IT, we have a dedicated team to help your company become accredited with Cyber Essentials. Whatever the size of company and no matter how big or small your IT systems are, we have a straight forward 5 step process that will assess your systems and not only provide the recommendations to gain certification, but also to perform the security work. Why should my business invest in Cyber Essentials? Cyber Essentials improves cyber security within your business. Small business owners think of cyber security as daunting, challenging and costly. However, Cyber Essentials provides small businesses with a cost-effective process using 5 security controls to protect from around 80% of cyber attacks. In addition to protecting your business, the scheme can help drive efficiency once you review your processes. Numerous government contracts now require their suppliers to have the Cyber Essentials certification and many business insurance companies will offer discounts for companies who have certification. A detailed report is produced specifying the work to be completed. Call us on 0161 241 9050 or fill in your details below and we’ll call you back.